Adding more straw to the Bay’s back. Image source: Jim M. Goldstein, JMG-GalleriesTalk about kicking someone when they’re down down. When the Cosco Busan collided with the Bay Bridge earlier this month, spilling 58,000 gallons of heavy-duty bunker fuel into the Bay, it was a heartbreaking reminder of the Bay’s vulnerability. As both a major shipping port and critical wildlife habitat, the Bay is at risk for an even more catastrophic spill. 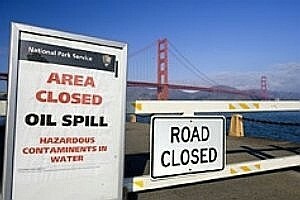 Obviously we need stronger regulations and stiffer penalties to prevent future spills. But we also need to continue working everyday to restore the Bay’s wetland habitat and freshwater inflows, and to reduce pollution, so that our Bay will be better able to protect and heal itself. It was heartening to see the public outpouring of concern for the Bay in the wake of the spill. Now it only remains for us all to harness that energy to continue working for a healthy Bay, even as the media coverage of the spill fades away. Although SF Bay is not within our marine sanctuary program, both Bolinas Lagoon and Tomales Bay are part of the Gulf of the Farallones National Marine Sanctuary. These two sites, which are designated Wetlands of International Importance (Ramsar Sites) like the bay, have been stressed in the past, but now enjoy special protection under the marine sanctuary aegis. We are working dynamically to restore damaged but still extraordinarily important habitats and prevent further impacts. Your “working every day” concept is vital to this effort. Thank you for focusing on the long-term picture.